I actually liked what I did. I can honestly say they looked better irl, but oh well! I wanted to wear the look for a few days, but for some reason my one and only grey polish seems to be missing!! Grr!! We (being my sister and I) know that she used it last.. And we literally looked everywhere. I am not impressed. 1 - it is a perfect grey to me and 2 - it is Orly.. that brand is not readily available to me.. I have to order it in. Guh. So not impressed. 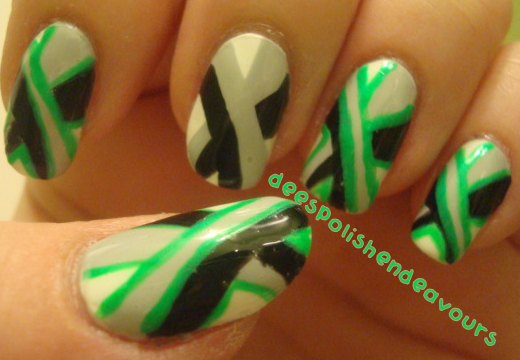 For this look, I used OPI Alpine Snow (will need a third/fourth backup asap), CG Liquid Leather & CG In The Lime Light. I also mixed Alpine Snow and Liquid Leather for the grey. I was going to keep mixing so I could paint up my other hand.. But I didn't want to use a bottle to mix, so it dries super quickly!! 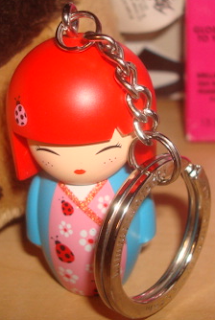 The key chain is also adorable, the container she came in reads 'Kimmi Junior' and she is Daisy.. My friend bought her because she has red hair and I enjoy dabbling in the redhead family hair pool! She is the one that also bought me that little Zhu Zhu pet hamster. His name is Tex and Bennie (the lovely pet degu) is not too fond of him as he squawks back! She loved the little hamster so much she went out and bought one for her cat to play with. Adorable! Then, one of my other close friends stopped in last night. First off, the bag she put my gifts in was white with black polka dots - I obviously loved it already!! She bought me an intriguing book called 'Little Bee' - seriously, there is basically no description (she even looked online, same thing) so that amazes me! I cannot wait to start reading it!! She also bought me this amazing peach body wash.. 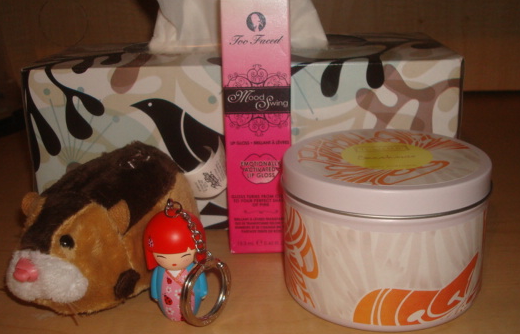 It smells like fuzzy peach candies.. And a really gorgeous candle (pictured above) the casing is so cute and it smells like fresh laundry.. I was burning it for a bit last night.. I plan on doing my nails pretty soon here.. So I will be smelling fresh laundry instead of nail polish! I am in no way bragging about these gems, I am just really happy about them all! Plus, if my friends ever stumble over this blog, they will know (even more so) how much I appreciate them! They are the best!! I hope everyone is having a great Thursday! I have to do my nails and go see my doctor.. I have a fairly busy day.. For me.. As of late! Your nails look awesome!! I love them. And yay for amazing friends! :D I've never had surgery, but once I was sick last year for a little bit and my friends brought a bag of my favorite candies and a balloon and left them on our front porch. They did the whole ding-dong-ditch thing. It was great. I am so glad that you are doing well after surgery! Welcome back and it looks like you have some amazing friends!